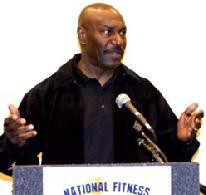 Lee Haney is one of the greatest bodybuilders in history winning eight consecutive Mr. Olympia titles. Now retired from bodybuilding, Lee is an educator and trainer and works with many world-class athletes. To Lee, success is more about fulfillment than trophies or titles, so in 1994, he and his wife, Shirley, purchased a forty acre farm near their home and created the Haney Harvest House, a non-profit retreat facility for children of all races, creeds, and nationalities. "I wanted to be able to give something back. I've been so fortunate to have a lot of good things come my way, and it all comes from values I learned from growing up." Lee's popularity and respected position within his field have provided him with a lengthy list of awards and recognition including Proclamations from three cities and distinguished acknowledgments from The President's Council on Physical Fitness, The United States Sports Academy and The International Federation of Body Building. President Bill Clinton appointed Lee, Chairman of the President's Council on Physical Fitness and Sports in 1999. 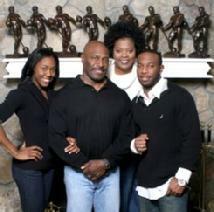 A devoted Christian, Lee has his own program on the Trinity Broadcasting Network called "TotaLee Fit with Lee Haney," where he is usually joined by famous Christian sportsmen and on occasion his wife. On the show he teaches the importance of both physical and spiritual growth and one of his more famous quotes is that we should "train to stimulate not annihilate." Lee and Shirley have two children and reside in Fayette County, GA.